Apple silently pushed its promised update to customers with its Apple TV device on Tuesday. The update will take about six minutes to download over a broadband connection, and another five to ten minutes to install. The update will install in three parts, with the Apple logo and progress bar reappearing each time. 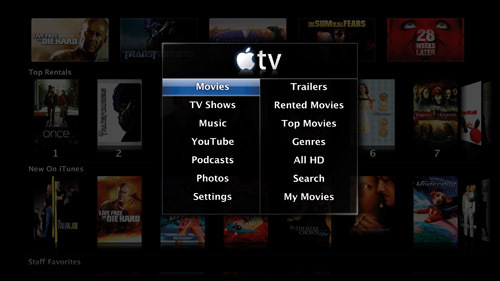 Users can find the download by located the Update Software option in Apple TV's menu. Apple TV Take 2 most notably brings high-definition movie content to the device, as well as a completely redesigned user interface. About 1,000 different movies are currently available for rent, with about 100 of them also available in high-definition. Rentals come at a price of $2.99 (or $3.99 for HD) for DVD-quality, and new releases are priced at $3.99 (or $4.99 for HD). Apple had originally promised the update at the end of last month, but the company was unable to finish the software in time for that deadline. No specific reasoning was given for the delay, which it announced at the beginning of this month. Devices built from here on out will come with the software preinstalled, Apple said. Apple TV is available from both Apple and its authorized resellers for $229 for the 40 GB model, and $329 for the 160 GB model.